I love simple baked potatoes, but it's always good to change it up. 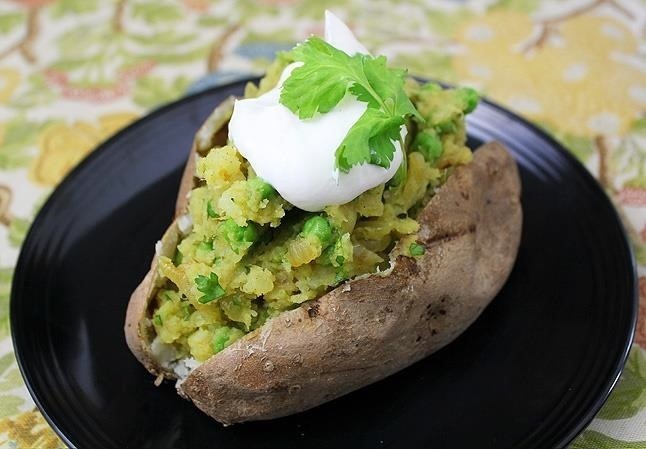 Here are some of my favorite ingenious ways to dress up and enjoy the humble potato. If you've never had Hasselback potatoes before, then you have been missing out. They combine the crispiness and flavor of sautéed or fried potatoes with the creamy softness of baked potatoes. Thank the Swedes for this amazing idea. Preheat your oven to 425°F degrees. 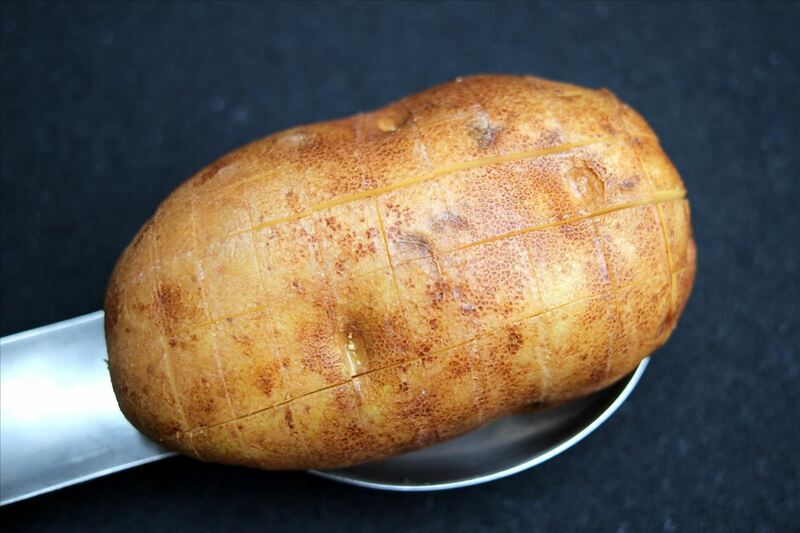 Scrub and dry your potatoes, leaving the skin on. Melt the butter and mix with the olive oil. 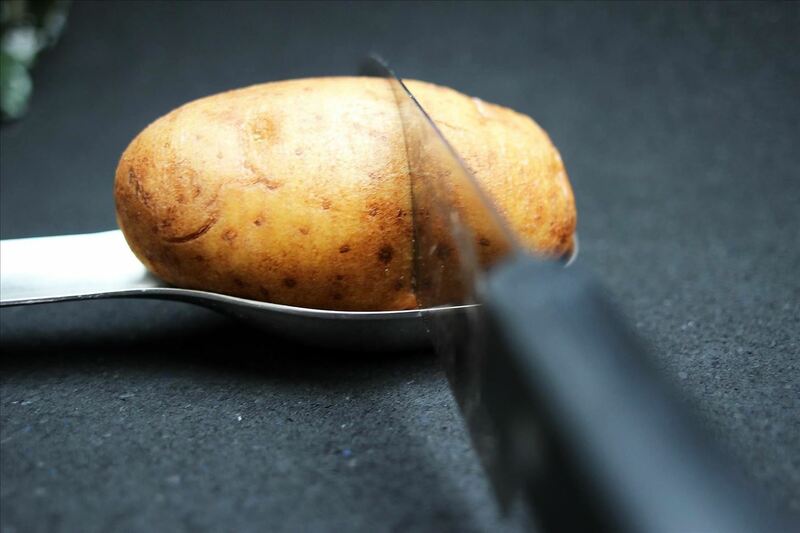 Place the potato in a large spoon and cut it several times. You want to make thin slices that never go through the entire potato. Put in a baking dish and drizzle each potato with ½ tbsp of the butter and oil mixture. Bake for 30-40 minutes, or until the potatoes start to open a bit. Drizzle each potato with the remaining butter and oil mixture. Add pepper and herbs to taste. Follow the directions above with half the amount of butter. Cut the potatoes into cubes instead, taking care not to slice through the bottoms. Whisk together 2 tbsp of softened cream cheese with 1 tbsp Sriracha. 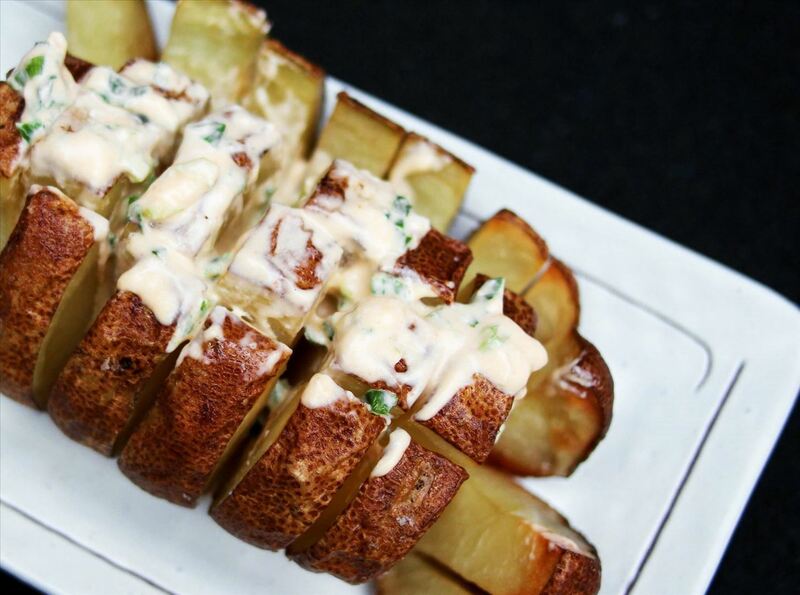 After the potatoes are done, drizzle them with the Sriracha cream cheese topping. Spice up your potatoes with all the flavor of Indian samosas with this recipe created by FromAway. Onions, curry, ginger, and mustard transport the everyday potato to another world. 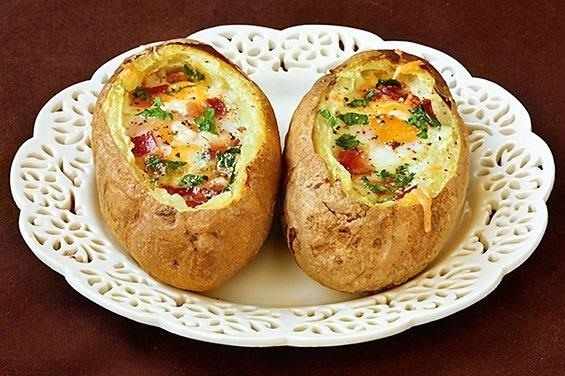 The holy trinity of breakfast foods—eggs, bacon, and potatoes—come together in this neat idea from Gimmesomeoven. Cute and tasty. One of my favorite things about visiting Montreal is the poutine, which is the fancy French way of saying fries topped with gravy and cheese curds. 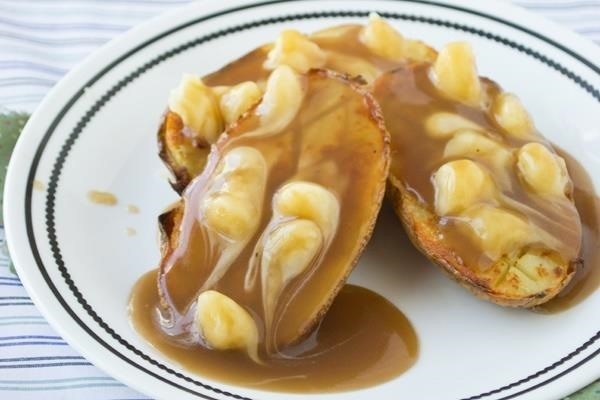 Top your baked potatoes with mozzarella and gravy for an easy, satisfying version of poutine. There are many other ways to elevate your relationship with potatoes, including how to peel a bag of potatoes in a minute, weirdly practical uses for potatoes, why instant mashed potatoes are a pantry essential, and how to make fluffier mashed potatoes without butter or milk. What are your favorite potato hacks? Lazy Poutine - Good way to use string cheese too. Just slice them up. Good idea. String cheese is always a winner. Use a wooden spoon to keep the edge of the knife sharp. 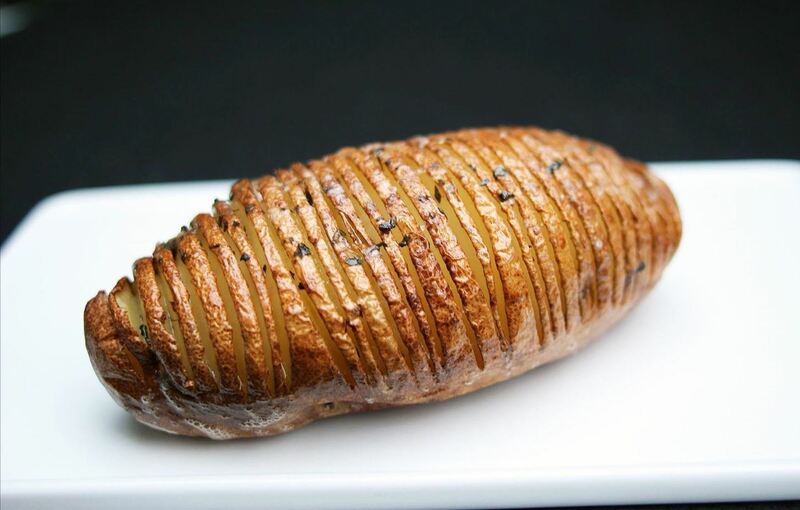 The original hasselback potatoes don't have the skin. Also breadcrumbs, salt and pepper is sprinkled on the top. Only butter and no oil. This recipe comes from the Swedish restaurant Hasselbacken that was changed to a restaurant school in the 1940, and the hasselback potatoes was invented by students at the new school. And yes, use a wooden spoon when cutting.